Last Minute: "Justice Department dismisses Democratic Mueller report subpoena as 'premature and unnecessary' - Washington Examiner" Fri, 19 Apr 2019 21:46:00 GMT "Hurricane Center reclassifies Michael to Category 5, the first such storm to make landfall since 1992 - The Washington Post" Fri, 19 Apr 2019 16:14:47 GMT "True ISIS believers regroup inside refugee camp, terrorize the ?impious? - The Washington Post" Sat, 20 Apr 2019 00:23:07 GMT "Body of missing 14-year-old Ohio boy found buried on farm - 10TV" Fri, 19 Apr 2019 20:43:26 GMT "Armed Mexican troops question American soldiers on US side of border - CNN" Sat, 20 Apr 2019 00:56:00 GMT "Florida deputy reassigned after video shows him punching teen in the head - NBC News" Fri, 19 Apr 2019 20:40:00 GMT "Reaction to Mueller Report Divides Along Partisan Lines - The Indian Express" Sat, 20 Apr 2019 00:34:11 GMT "Democrats reject Barr's offer to see less-redacted Mueller report - Aljazeera.com" Fri, 19 Apr 2019 23:34:00 GMT "Turpins Sentenced to Life In Prison For Starving, Shackling Children - NPR" Fri, 19 Apr 2019 22:55:00 GMT "'No authority': New Mexico governor tells militia to stop arresting migrants at border - NBC News" Fri, 19 Apr 2019 19:21:00 GMT For more news, click here. TR4DER Tags, which are them and how to use them? These two buttons, have two different functionalities, the one represented by the informative button “I” is used to show some information and chart about a certain asset, and the one which has a chart on its icon is the one that allows us to show a chart of a certain asset. The info one is used with the [ info] and [ /info] tags, and the chart button is used with the [ chart] and [ /chart] tags (without spaces). As you can see, the quickly view of the chart functionality with information about the asset have been used on a simple thread of this or any forum (as you can see in the Webmaster Resources how to use them on your own forums). When you want to talk about an asset you can simply put without spaces [ info]MSFT[ /info] and you'll have for example in this case a link to the page with a quick preview when moving the mouse over with information and a chart. This is a quick way to show a chart of a certain asset on the forum. But this option is more complete than it may look like, you can also define the time frame as well as the chart width and height! And how to put the image with a 400 pixels width and 300 pixels height? And voilà! 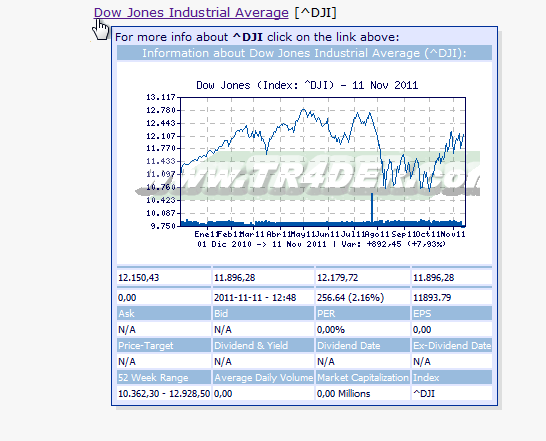 An intraday chart of Dow Jones Industrial Average with the size we want, embedded in the forum itself. If it has more width or height than a certain limit which would go around 700 pixels, or less width or height than the minimum, the maximum or minimum widths or heights will be used instead, according with the limits which have been surpassed. If no values are inserted, default values will be used. The same happens with the time-frame, if none is defined, the default value will be used, which is usually 1 year. In case you have any doubt you can always click on the “quote” button on the post in which someone has used some charts, and see the code they've used to create them, their tags, etc. Another important thing to have in mind is that these charts are dynamic, they can have some value at a time and a different value at another time, as you can see the last candle with a different value 10 minutes later during a trading day, so if you want to put a fixed and unchangeable chart as an example, you'll have to save it first on your hard drive through that asset's info page, and then using it on the post as an attachment, uploading it to the post, and that way it will already be used as it is, on a fixed and unchangeable image and not a possibly real-time dynamic chart. But on a daily basis this two tags could be very useful to you, the [ info ] and the [ chart ] ones. Remember that a simple [chart ]symbol[ /chart] without any additional information would show you a chart with default values of that asset you have chosen with the default time-frame (usually 1 year). There is also another icon, the which is also shown on the new posts interface and visible when we're editing a message or a new thread, that is used to embed Scribd PDFs inside the post. When clicking upon it, the tags [ scribd] and [ /scribd] appear, and between them we'll put the Scribd code which comes after the "id=" on the embedded code which they give us. (On the new links we would have something like: "http://pt.scribd.com/full/28713759?access_key=key-2ed4kkruzu9o1sni3wsk" and from here we would use just the "28713759?access_key=key-2ed4kkruzu9o1sni3wsk" and substitute the "?" by "&" and would have the link already made: [ scribd]28713759&access_key=key-2ed4kkruzu9o1sni3wsk[ / scribd]). Now we can embed inside our posts the PDFs we find on Scribd. For those who might have forgotten, you can also put YouTube videos with the [ youtube ] Tag, just by putting the video code between the [ youtube ] and [ /youtube ] tags. If you have any doubts don't hesitate to ask us here, or even sending your opinions, as well as suggestions and ideas, anything that might help us improve these functionalities and make them more pleasant and practical to you, because they were created for you.